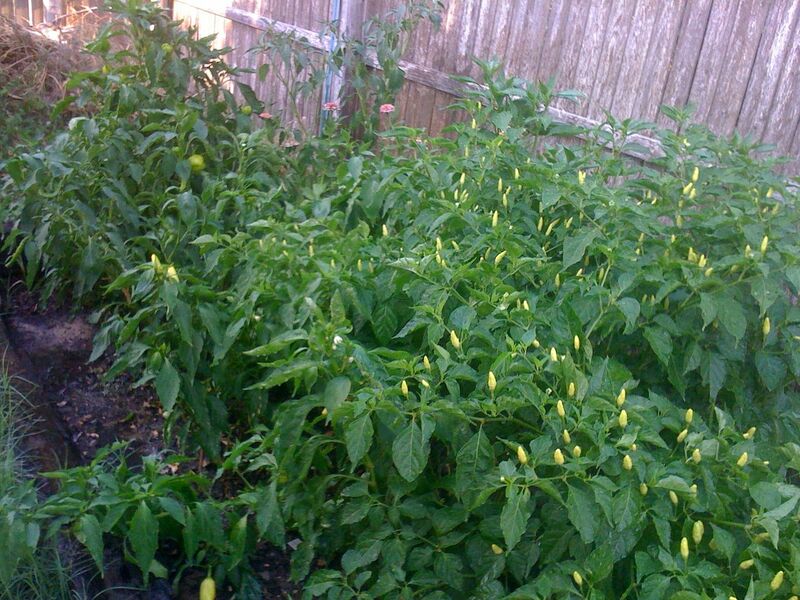 Out watering this morning, and I know, since our peppers are very happy, that yours are too! So time for some thoughts on chile preservation. If you get lots of chiles and peppers, (And if you can, you should, plain and simple), you need to think about preserving them. Here again, two time honored methods come into play; drying and canning. 1. If you don’t have canning equipment, ask around, check Craigs list, etc; even in the 21st century, lots of folks have them and of those, most don’t use them! 2. When canning, use good quality cooking or canning salt ONLY, NEVER table salt; table salt is most often iodized and will turn your stuff black and make it taste funky! 4. ALWAYS practice safe canning; follow sterilization routines to the letter and without fail, each and every time! 5. Always leave enough headspace in your canning jars; 1” for low acid foods like chiles, ½” for high acid fruits and tomatoes, ¼” for jams and jellies and whatnot. When canning chiles, you have the option of pickling or not; that said, doing them up fresh is gonna require pressure canning capability. Let me say that again; if you choose not to, you MUST pressure can your chiles. Chiles are not a high-acid food, (Like tomatoes for instance), so there are many more opportunities for bacteria to grow in the canned product. If you like your chiles as they are and have the ability to pressure can, then DO, ‘cause this is the best way to preserve great chile taste long-term. If you want to add a little salt for taste ¼ tspn per pint is plenty. You certainly can roast your chiles and can them that way as well, they are wonderful in cold weather favorites like enchiladas, soups, chili and lots of other things as well. Follow the guidelines for your pressure canner, but in general, fresh processed chiles need to reach an internal temp of 240º F and maintain a boil for at least 10 minutes below 1000 ft. in altitude, (Which I believe y’all are all a bit above); add another minute to the boil for each additional 1000 ft.
Also, prick your chiles with a pin before canning, so they don’t collapse on ya. We LOVE Jalapenos; they are, in fact, our go-to chile here. We use ’em in eggs, salads, almost everything. Good ones have a mild bite and a fresh chile taste that lends it self well to many, many dishes. Your chiles must be hot when you brine them, so take them right from the blanch and stuff them into jars – not too packed but not too loose; they will lose some volume during processing, so err to the side of full, but leave at least ¾” headroom in each jar. Divide your pickling spice up by number of jars and spoon even amounts into each, (Just scale your recipe up or back as needed for more or less spice). Bring the brine to a boil and then carefully pour it into each jar. You want to leave a good 1” of headspace in these jars, it’s very important! Process for 12 minutes and then set out to cool. These are best if left for at least a month to get acquainted before eating. Use pickling mix and process as shown above and go wild! Ever had killer Molé, that food of the Gods from south of the border? IN some of the legendary red and black Molés, say from Oaxaca, might have anywhere from 20 to over 40 ingredients, and you know what the real key to them is, the Corazon? Dried chiles, and that’s no lie. Ancho, Pasilla, Mulato, Chipotle, Guajillo, Costeño, all those famous and mysterious chile names; know what they are? Various forms of dried and sometimes smoked chiles, and that’s a fact. Ancho and Mulato are dried Poblanos, which y’all have, and Pasilla is a dried Chilaca: These three dried chiles are kind of the Big Three for Molés, and you can and should make them yourselves! Drying chiles ain’t hard, but to get really good, consistent results that will last, taste, smell and look best, I really think you need a food dehydrator. Let’s face it; humidity isn’t something we can control outdoors, or inside all that well. In a pinch, you can use an oven, but it’s really too hot, even on warm. I know folks who have done homemade rigs using light bulbs, but I have safety concerns about that: Fortunately, dehydrators are cheap and also happen to be another thing that many folks have and few use; you should be able to snag a used one quite easily. To simply dry chiles, set them out with plenty of air space all around and let them dry thoroughly and completely. We have an early rush of Tabasco peppers this year, so I dried a bunch the other day; the smell is outta this world! To add smoke to dried chiles, I smoke them prior to drying, which you can do too. I have a smoker, of course, (That and a tiny rat dog are required for Texas residency, FYI), so I use that most often. I also have some very high quality smoke powder, made from nothing but water and wood smoke run through it, that I use when I don’t want to smoke, (Like now, when it’s 106 outside, fer instance). I’ll rub the chiles with a little olive oil and sprinkle or roll smoke powder on ‘em, and then dehydrate and there ya go! Question o’ de Day: What is blanching and why do I care about it? Blanching is the process of plunging stuff into boiling water, (And sometimes steam), very quickly, after which you pluck ‘em out and stuff ‘em under an ice water bath; yes, it is that simple! Blanching also makes peeling a bunch easier for things like tomatoes, peaches, or really annoying stuff like Fava Beans. Blanching is considered a must-do step in good restaurants prior to serving veggies as a crudité, (Fancy French word for raw veggies served, sliced or whole, as a nice, simple meal course, with a little salt, butter, olive oil, vinaigrette, etc), or if they are to be used later for various dishes, or stored for any length of time. Blanching and peeling is a great way to treat fruit and veggies that DON’T come from NG or KG, that maybe have been treated with various crap we don’t really wanna eat, capiche? Even if we are working with great veggies or fruit form the gang, blanching and peeling, (When called for), is the way to prepare stuff for freezing: Blanching kills bacteria and also slows down the enzymes that cause stuff to go bad. When blanching to freeze, put a little salt in the blanching water to help further preserve color, flavor and crispness. Blanching also comes into play when prepping a bunch of things that are gonna go together in a dish, like for a stir fry or pasta dish. Blanching helps the constituents stay crisp and pretty, and don’t get mushed out or lost in other flavors once they’re combined. Finally, taking the boiling a bit further, we can parboil stuff, (AKA, partially cooked), which speeds up and/or equalizes cooking time for disparate components in a dish; there’s another restaurant secret for ya. This is how stuff like carrots and diced onions come out ‘perfect’ and at the same level of doneness when cooked together. Quite a few chiles freeze really well, so don’t discount this method for long-term storage; Every year down here, we get Hatch chiles from New Mexico about this time of year. I split mine between canning, drying and freezing, with the majority roasted. They are the core of winter chile sauces for me, and the frozen ones lend themselves perfectly to a quick menu selection. While with the roasted chiles, I prefer to leave the skins on for flavor and remove them after thawing, for plain ol’ chiles, you’re best plan is to blanch ’em, skin ’em and freeze away. Here again, glass is way better than plastic! Previous Previous post: Great Dinner, Gang! Next Next post: Viva Tomate!